While British and American archival labels delve back into the musty corners of the 1970s for obscure artists and records to reissue, we don’t have to look back any later than 1991. 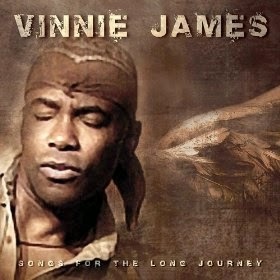 I’m referring to Mr. Vinnie James, a talented and criminally obscure folk-rock singer/songwriter who hails from “parts unknown”…one online account has him growing up in Harlem, another in Newark, New Jersey, the latter considering him a “Jersey Shore sound” artist in the vein of Bruce Springsteen and Southside Johnny Lyon. Nevertheless, James ended up in Los Angeles during the late 1980s, playing with a band called Rumbletown, about which even less is known save for James’ position as singer and guitarist. James’ personal website is maddeningly sparse, with links to various social media accounts and not much more. It’s almost as if he emerged from the ether to release one incredible album, and then disappeared again into myth and obscurity. 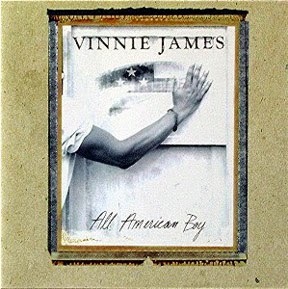 James released All American Boy, his debut album, in 1991 on Cypress Records, which was distributed by RCA. Working with the cream of the crop of L.A. studio pros, including drummer Kenny Aronoff, guitarist Randy Jackson (Mr. American Idol), and keyboardist Al Kooper, James and noted producer Thom Panunzio (who has worked with Springsteen, John Lennon, and Patti Smith) crafted a fine eleven-song collection that, while it may sound a little slick for an artist of James’ folkish tendencies, still manages to capture his charisma, melodic sense, and erudite lyrics. In spite of the major label clout afforded RCA-distributed product at the time, All American Boy just didn’t seem visible on the streets. As somebody who spent an unhealthy amount of time hanging around record stores back in the day, I can avow that you just didn’t see James’ album, even in the cut-out bins. High profile tours opening for artists like Sade, Tina Turner, and Bonnie Raitt didn’t seem to help move units, either, and may have been somewhat ill-conceived. Although James might have been a good fit opening for Raitt, he may have been better served touring with somebody like Tom Petty. James’ soulful style of folk-rock is similar to that of another artist worthy of rediscovery, Mary Cutrufello, the sort of blue collar, lyrically-focused “heartland rock” that was the signature sound of Springsteen, John Mellencamp, Bob Seger, and similar fellow travelers. Although James received sporadic critical acclaim from the few writers who actually listened to the album, and favorable comparisons to artists like Graham Parker and John Hiatt were made, All American Boy came and went without leaving much of a splash in its wake. James still seems to be performing, and he’s released a couple of albums since his debut – 2007’s Songs For The Long Journey and 2011’s Storm – but he mostly seems content these days to write songs and perform in his adopted U.K. homeland. As you can hear for yourself via the videos below, Vinnie James is an artist of no little talent and vision, certainly worthy of rediscovery. Thanks for reminding me of this great album. I've just taken it off the shelf and put it on the turntable. It sounds as great today as it was 24 years ago!